Preface: This poem began on November 21, 2007 while noticing yellow ginkgo leaves during my walks. I knew Goethe had written a poem "Ginkgo Biloba" in Heidelberg and imagined meeting him there. Goethe had been my spiritual mentor since my freshman days at Columbia. I relate this story in my Poetry Anthology for Robert Pinsky's Stanford Poetry Workshop (Winter 2007), when I selected Goethe's "Winter Journey in the Harz" (1777). Also included in the Anthology is Goethe's Faust which I quoted in the Prologue of my Cornell Ph.D. Thesis in Chemistry. To write this poem, I consulted books in the Stanford stacks and compiled notes of Goethe in Heidelberg and Goethe and Ginkgo to set the mood and historical context. However, I didn't know how to proceed after writing the first four stanzas. I read my favorite Goethe books Conversations with Eckermann and Italian Journey for inspiration. 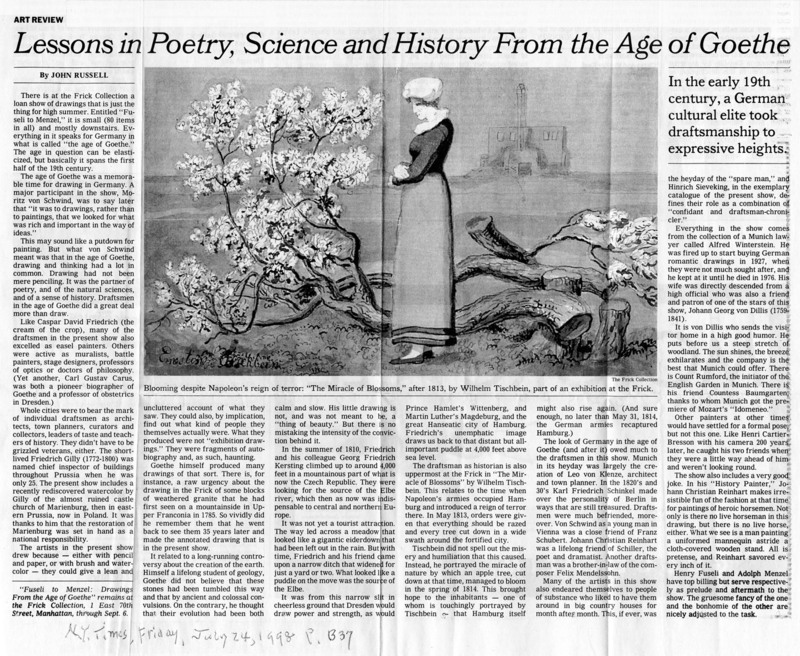 While reading the latter, I found Dad's clipping from the New York Times (July 24, 1998, B37) "Lessons in Poetry, Science & History from Age of Goethe" which he had inserted in the book. I wrote this haiku: "A nice gift from Dad / placed in my book when he was / 96 years old." During Finals Week, Stanford Library closes at 2 am. While walking down Palm Drive around 2:30 am on December 13, 2007 to catch Bus #22 at Palo Alto Train Depot, I imagined Goethe taking me to the Alchemy Museum in Castle Heidelberg where I had visited in 1976. Finally I found a linkage between the writing craft and the ancient craft of alchemy. At 1:55 pm on December 13, 2007 just before boarding Bus #35 at Showers Drive, Mountain View on my way to Foothill College Computer Lab at Middlefield Road, Palo Alto a bumble bee flew to my nose, and this haiku came: "The Bumble Bee flew / to my nose. Is that you Dad? / always in my heart!" It was the 7th anniversary of Dad's passing on Dec. 13, 2000, 4:32 pm. When I got to the Computer Lab, I finished writing this poem around 5 pm. Going outside facing the soccer field, I prayed to the new crescent moon above a streak of light yellow sky. I thanked Goethe, the ginkgo, and the spirit of my Dad all inspiring me to finish this poem. These notes are my homage to Goethe who has inspired me in science and poetry. The "field of yellow" refers to the ginkgo leaves scattered under the tree in autumn. There are ginkgo trees on Ortega Avenue that I pass by on my walk to El Camino to catch Bus #22 to Stanford. 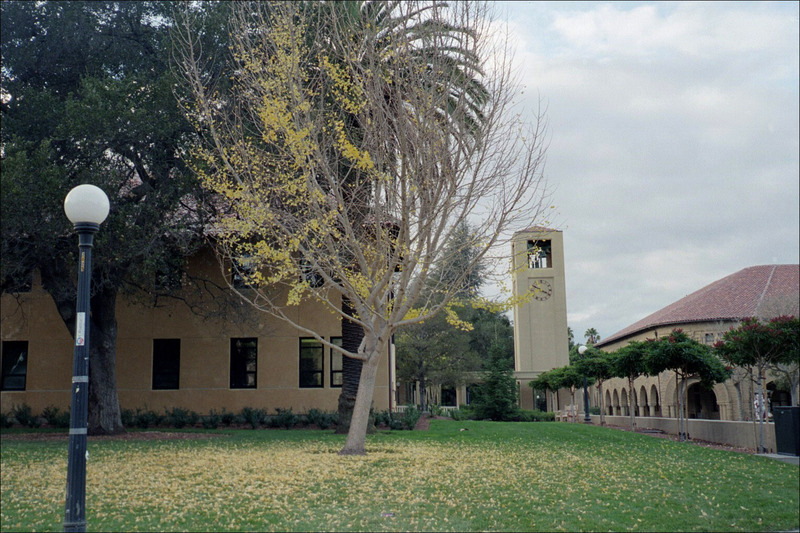 There is also a ginkgo tree in the Stanford Quad (photo at left) near Barnum Center and the Clock Tower (Escondido Mall) as I walk to Green Library. Seeing these yellow ginkgo leaves prompted me to write this poem. Unlike Newton's analysis of color in terms of frequency and wavelength, Goethe's studies (Farbenlehre, 1810) were based on an artist's observation "At noon, the sun appears, colorless in its brightness. This changes as the sun begins to set: at first it turns yellowish, then gold, then finally orange, and even deep red, as it sets on the horizon... Through the slight resistance of a translucent medium, pure light is softened to a cheerful sunny yellow, which has a light, expansive quality." The Ginkgo (Ginkgo biloba) is also known as the Maidenhair Tree. 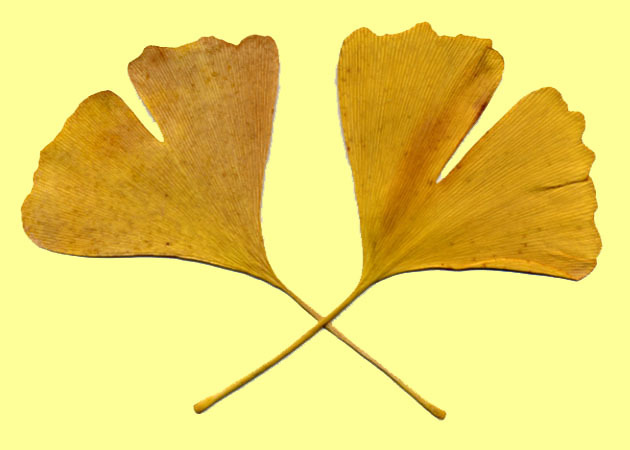 Fossil records have dated the ginkgo back to the Pliocene era (5.3-1.8 million years ago). Chinese monks have tended ginkgo tree in their temples, cooking ginkgo nuts for food. Ginkgo leaves are unique among seed plants, being fan-shaped with veins radiating out into the leaf blade, sometimes bifurcating (splitting). Ginkgos are dioecious, with separate sexes, some trees being female and others being male. The Ginkgo is one of the world's most urban-tolerant trees, often growing where other trees cannot survive. Extracts of Ginkgo leaves contains flavonoid glycosides and terpenoids (ginkgolides, bilobalides) and have been used pharmaceutically. Its use as memory and concentration enhancer has not been confirmed. The Japanese haiku master Basho (1644-1694) wrote in Kawazu Awase (1686): "Go to the pine or bamboo if you want to learn about the pine or bamboo. Leave your ego behind, otherwise you impose yourself on the object and do not learn. Your poetry comes naturally when you have become one with the object. When you plunge deep into the object, you'll see a hidden glimmering there. If your feeling is not natural, if you and the object are separate then even your well phrased poetry is not true poetry but merely your subjective counterfeit." In Conversations with Eckermann (March 7, 1830), Goethe (age 80) says: I have never affected anything in my poetry. I have never uttered anything which I have not experienced, and which has not urged me to write. I have only composed love songs when I have loved. How could I write songs of hatred without hating!". I imagined Goethe communing with the ginkgo tree, but was ecstatic in finding this entry in Conversations with Eckermann (June 15, 1828): A few days after the Grand Duke of Weimar's death, Goethe went to the castle at Dornburg to escape the melancholy impressions in Weimar. Goethe tells Eckermann: "I enjoy here, both good days and nights. Often I awake before dawn and sit by the open window to contemplate the splendor of the three planets which are now to be seen together, and to refresh my soul by the growing glow of dawn. I then pass almost the whole day in the open air and hold spiritual communion with the tendrils of the vine. They say good things to me, and of which I could tell you wonders. I also write poems again, which are not bad. And if it were granted me, I should like always to remain in this situation." Goethe discusses the art of writing often in Conversations with Eckermann. (Sept. 18, 1823): "It is not enough to take steps which may some day lead to a goal; each step must be itself a goal and a step likewise... The world is so great and rich, and life so full of variety, that you can never want occasions for poems. But they must all be occasional poems; that is to say, reality must give both impulse and material for their production. A particular case becomes universal and poetic by the very circumstance that it is treated by a poet. All my poems are occasional poems, suggested by real llife, and having therein a firm foundation. I attach no value to poems snatched out of the air... Reality must give the motive, the points to be expressed, the kernel, as I may say; but to work out of it a beautiful, animated whole, belongs to the poet... A great work requires many-sidedness, and on that rock the young author splits." (April 20, 1825): "The poet should strive after manifold knowledge, for his subject is the whole world, which he has to handle and to express. However the poet should not try to be a painter, but content himself with reflecting the world in words, just as he allows the actor to bring it before our eyes by personally exhibiting himself... The objectivity of my poetry may be attributed to this great attention and discipline of the eye. I ought highly to prize the knowledge which I have attained in this way." 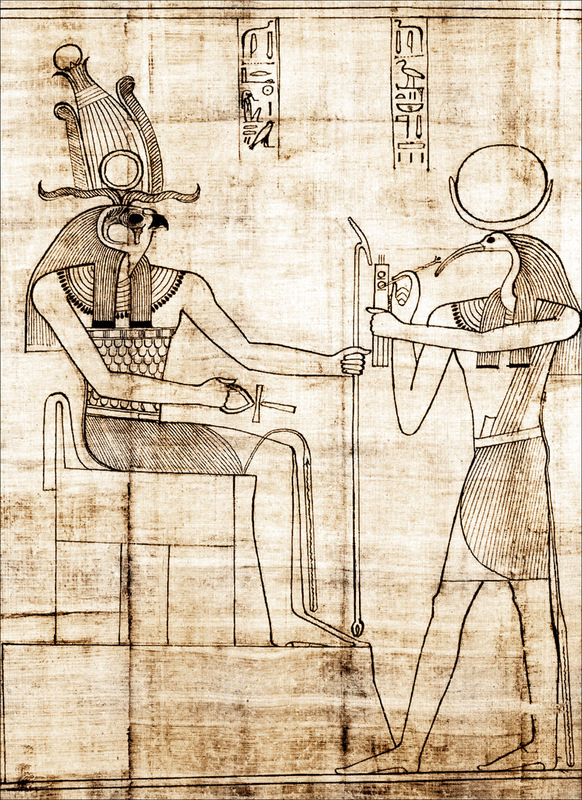 Image: Egyptian drawing of 21st Dynasty (c. 1000 BC) from the papyrus of Nestanebanshru showing Thoth (Tehuti) standing before Ra Hormachis wearing symbols of creation on his head. Throughout the history of alchemy Thoth was regarded as Hermes Trismegistus. The Emerald Tablet is attributed to Hermes or Thoth, who is the wisdom of God personified as a being with the poetic symbol of an ibis head. 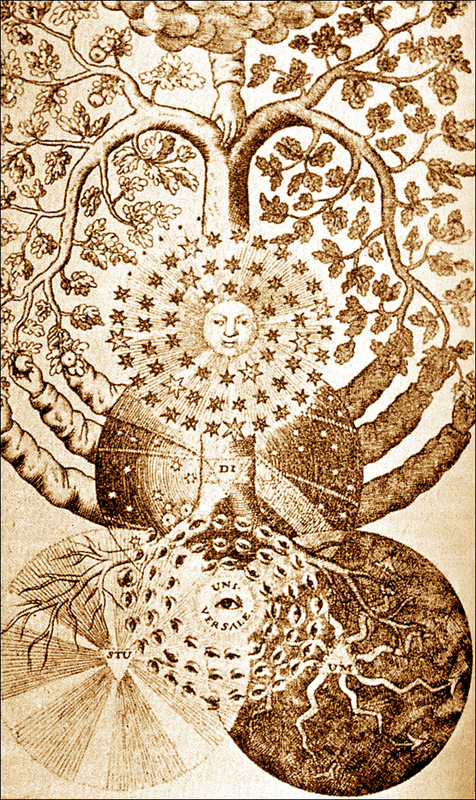 The spirit of poetic symbolism is also a root of alchemical methods of expression. Thoth has been likened to Plato's Logos. Thoth is involved in teaching writing and science to man. Goethe went to Heidelberg for the first time in 1775 (age 26) according to his autobiography Dichtung und Wahrheit (History of Heidelberg, 1100-1900). His next visit to Heidelberg was in August 25-27, 1797 (age 48) when he bid his mother farewell in Frankfurt at 7 am on August 25, arriving in Heidelberg at 9:30 pm. In this journey he viewed panoramas of blue hills and then the purple evening night. Thus the 9th line in my poem "he opens his eyes to the deep blue sky". On Aug. 26, Goethe walked the footpath along the right bank of the Neckar in brilliant sunshine. He also visited the old ruined Castle (Goethe & Heidelberg). Goethe's last visits to Heidelberg were in 1814-1815 (age 66) with the Boisseree brothers and with Marianne Willemer when he wrote his Ginkgo Biloba poem. 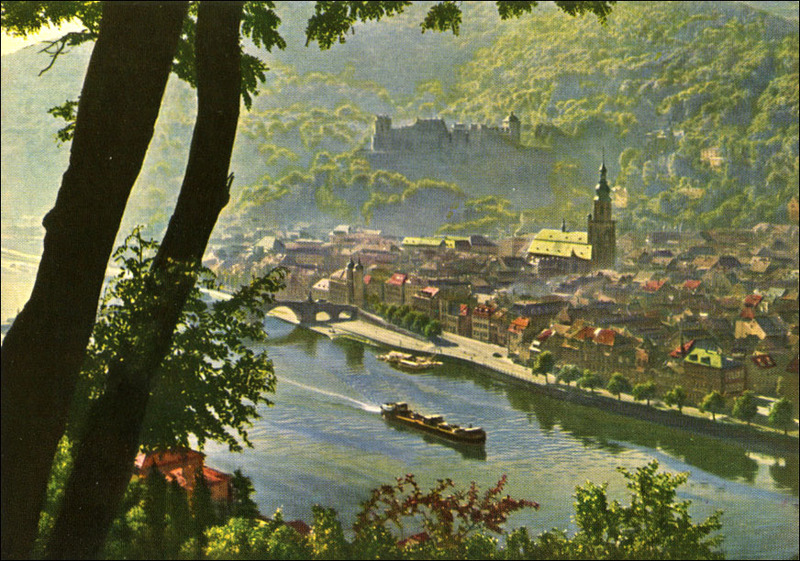 Image: Postcard of Neckar River from Philosopher's Walk with Castle Heidelberg in the distance. Goethe wrote his "Ginkgo Biloba" poem inspired by the Ginkgo tree in the garden of Heidelberg Castle. When I presented my paper "Computerized Prediction of Protein Conformation" at the 10th International Congress of Biochemistry in Hamburg, Germany (July 25-31, 1976), I visited Heidelberg for its famous University and the scenic Neckar River. When I went to Heidelberg City Hall, the guide at the desk told me about the Alchemy Museum in Castle Heidelberg. I went there at once as part of my spiritual quest, and was rewarded by my visit. At the time, I didn't know that Goethe had written his "Ginkgo Biloba" poem there, so I could have paid my tribute to the ginkgo tree and taken a photograph of it. I'd meditate in the garden grounds where Goethe walked and drew his inspiration. 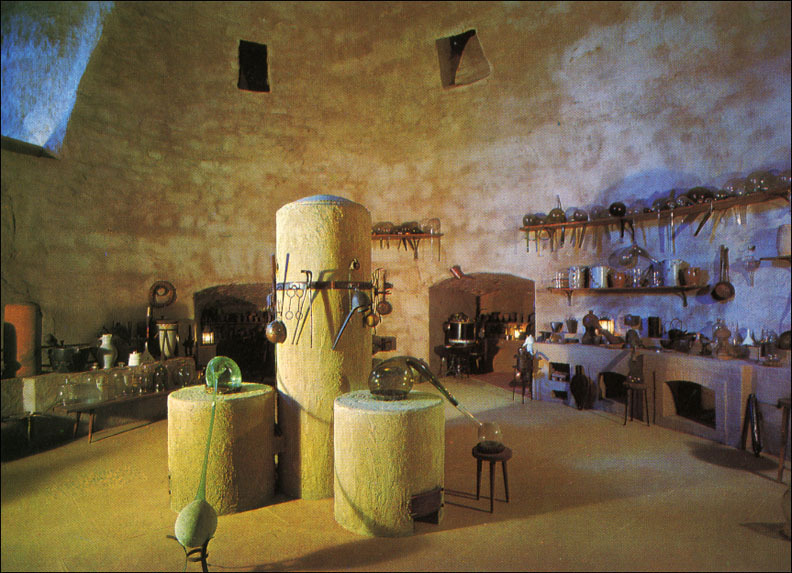 I imagined Goethe taking me to the Alchemy Museum because he was fascinated by alchemy in his youth. During his illness in 1768-69, the 19 year-old Goethe began reading alchemical texts as well conducting alchemical experiments. I recall reading Goethe's Autobiography while at Cornell, how he hid from Herder his alchemical studies: "But, most of all, I concealed from Herder my mystico-cabalistical chemistry, and everything relating to it; although at the same time, I was still very fond of secretly busying myself in working it out more consistently than it had been communicated to me." I can't find my copy of Goethe's Autobiography now, but found a similar copy in the Stanford stacks (PT2027.A8O8) just 33 paces from my computer desk at Green Library. There were a lot of chemical flasks, retorts, bottles, and all kinds of alchemical memorabilia in the Alchemy Museum. However, I was awed by a unicorn's horn mounted by two ropes hanging near the ceiling. 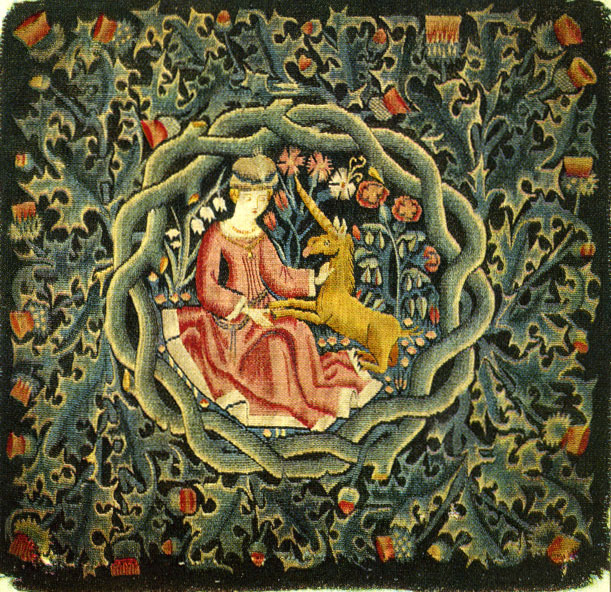 I had read about the unicorn's legend, visited the "Unicorn Tapetries" at the Cloister's Museum in New York (also Cluny Museum in Paris, 1979). In 551 BC, Confucius' pregnant mother met a Unicorn in the woods. It gave her a small piece of jade and placed its head in her lap. She realized the importance of the event and knew it was a good omen from the gods. When someone brought an unknown beast the Chi-lin to Confucius in his old age for identification, he sighed: "My time has come. Heaven is calling me home!" The narwhale (Monodon monoceros) swim solely in the Arctic waters. It is rarely found south of latitude 70o N. The name Narwhal means "corpse whale" because it often swims belly up, laying motionless for several minutes. Narwhals usually take their time going places, slowly breathing and rolling, but when chased, they are remarkably quick. I don't know whether Goethe has ever seen a narwhale or visited the Alchemy Museum in Heidelberg. However, Goethe's did scientific investigations all his life in addition to his voluminous writings of poetry and drama. At the invitation of Carl August, Grand Duke of Saxe-Weimar-Eisenach in 1775, Goethe went to live in Weimar where he held a succession of political offices, becoming the Duke's chief adviser. At first it was in Theatre and Drama, then in Meteorology, and later Bureau of the Mines. With his focus on morphology he influenced Darwin. Goethe's studies led him to independently discover the human intermaxillary bone in 1784, which Broussonet (1779) and Vicq d'Azyr (1780) had identified several years earlier. In 1790, Goethe published his Metamorphosis of Plants. In 1810, Goethe published his Theory of Colours. After being translated into English by Charles Eastlake in 1840, this theory became widely adopted by the art world, most notably J. M. W. Turner. It also inspired the philosopher Ludwig Wittgenstein, to write his Remarks on Colour. When MIT Press published Goethe's Theory of Colours (March 15, 1970), I bought a paperback edition from Anthony's bookshop in Ithaca. Edwin Land, the CEO of Polaroid was giving a talk at Cornell on "Color" (Spring 1970), so I brought my Goethe book to his lecture. I asked Land that since it was a translation from Goethe's 1810 book, how relevant is the information 160 years later. Dr. Land told me "You were wise to buy Goethe's book. I've learned so much from his insights." Since Edwin Land, the inventor of the Polaroid Camera has the second highest number of patents (535) after Thomas Edison (1097), I trust his scientific judgment, and deepened my love for Goethe. Two books on Goethe as scientists: Goethe on Nature & on Science by Sir Charles Sherrington, Cambridge University Press, 1942 (832.62.DS552) and Goethe the Scientist by Rudolf Steiner, Anthroposophic Press, NY, 1950 (PT2206.S712). During my visit to the Alchemy Museum at Heidelberg Castle, I was surprised to see an oil painting titled Christ the Alchemist by Gregor III from Salzburg-Steiermark (circa 1740). It showed Christ pointing to his heart. I stood in front of the painting and meditated on how Christ has transformed so many people through his teachings in the Gospels such as his Sermon on the Mount. In Edward F. Edinger's The Mysterium Lectures (1995), we find notes on Christ's life compared to the alchemical process: "Christ went through the worm experience of humiliation in the process of death and rebirth of the God-image. According to the alchemical symbolism these images pertain to Mercurius. Jung discusses at length in Psychology and Alchemy, the whole theme of the alchemists' parallel of the Philosophers' Stone to Christ. In Waite's Hermetic Museum, an alchemist describes the transformation process going on in the alchemical flask in terms of the Passion of Christ." (Edinger, pp. 213-214). 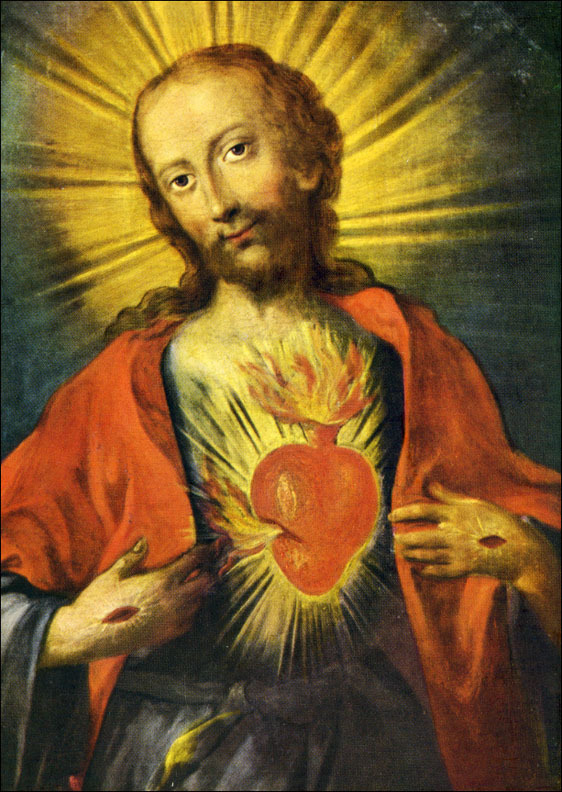 Image: This painting shows Christ's heart as an alchemical furnace. It was found with my postcards from Heidelberg's Alchemy Museum. Inscription on the back: Wien, Stephansdom / Herz Jesu, 18 Jh. indicates that this is an 18th century painting from Vienna's St. Stephen's Cathedral. No artist is mentioned so it may not be by Gregor III mentioned in the 6-page brochure "Guidebook to the German Pharmacy Museum in the Heidelberg Castle". In Conversations with Eckermann (March 11, 1832), Goethe, now 82.5 years old and 11 days before his death, spoke for an hour with Eckermann on the Bible: "I look upon all the four Gospels as thoroughly genuine; for there is in them the reflection of a greatness which emanated from the person of Jesus, and which was of as divine a kind as wever was seen upon earth. If I am asked whether it is in my nature to pay Him devout reverence, I say certainly! I bow before Him as the divine manifestation of the highest principle of morality. If I as asked whether it is in my nature to revere the Sun, I again say certainly! For he is likewise a manifestation of the highest Being, and indeed the most powerful which we children of earth are allowed to behold. I adore in him the light and the productive power of God; by which we all live, move, and have our being we, and all the plants and animals with us. But if I am asked whether I am inclined to bow before a thumb bone of the apostle Peter or Paul, I say 'Spare me, and stand off with your absurdities!'... for as soon as the pure doctrine and love of Christ are comprehended in their true nature, and have become a vital principle, we shall feel ourselves as human beings, great and free, and not attach especial importance to a degree more or less in the outward forms of religion. Besides, we shall all gradually advance from a Christianity of words and faith, to a Christianity of feeling and action... God did not retire to rest after the well-known six days of creation, but, on the contrary, is constantly active as on the first. It would have been for Him a poor occupation to compose this heavy world out of simple elements, and to keep it rolling in the sunbeams from year to year, if He had not had the plan of founding a nursery for a world of spirits upon this material basis. So He is now constantly active in higher natures to attract the lower one." Goethe was silent. But I cherished his great and good words in my heart. This little chemistry exercise satisfied my curiosity that such miracle is possible. Although the equation is stoichiometrically correct, it's not how ethanol is produced. The story of Christ feeding 5000 from only five barley loaves of bread and two small fishes is from John 6.9-14 (also Matthew 14.19-21, Mark 6.41-44, Luke 9.13-17). This is still a mystery to me, although Christ could have conjured up some manna as Moses did in feeding the Israelites (Exodus 16:14-15). Such supernatural powers are beyond our human ken, but in the realm of the spirit, all things are possible. So keeping an open mind will help us understand some of the miracles of the yogis, magis, and sages. All trees are anchored in Mother Earth, but derive their germination and nourishment from Father Sun, whose sunlight create photosynthesis in plants. During his stay in Italy (1786-88), Goethe spent much time visiting gardens and vineyards for botanical studies. In his letter to Herder (Naples, May 17, 1787), Goethe writes "I must tell you that I am very close to the secret of the reproduction and organization of plants, and that it is the simplest thing imaginable... The Primal Plant is going to be the strangest creature in the world, which Nature herself shall envy me." In his second visit to Rome, Goethe notes (July 31, 1787): "While walking in the Public Gardens of Palermo, it came to me in a flash that in the organ of the plant which we are accustomed to call the "leaf" lies the true Proteus who can hide or reveal himself in all vegetal forms. From first to last, the plant is nothing but leaf, which is so inseparable from the future germ that one cannot think of one without the other." Goethe originated the study of plant morphology (1790). Because Goethe's research in trees, plants, and flowers, I imagined him telling me to pay homage to the trees since they provide us with the paper in which we write as well as read in books. Image: "That which comes from the tree of knowledge" the Zohar has it, "bears duality within itself". The fruits of love and anger, of light and darkness, of eternity and time. Although Adam decided in favour of the dark fruit of mortality, he has the freedom to choose, for the world of elements consists of both root-forces, of the light and the dark. 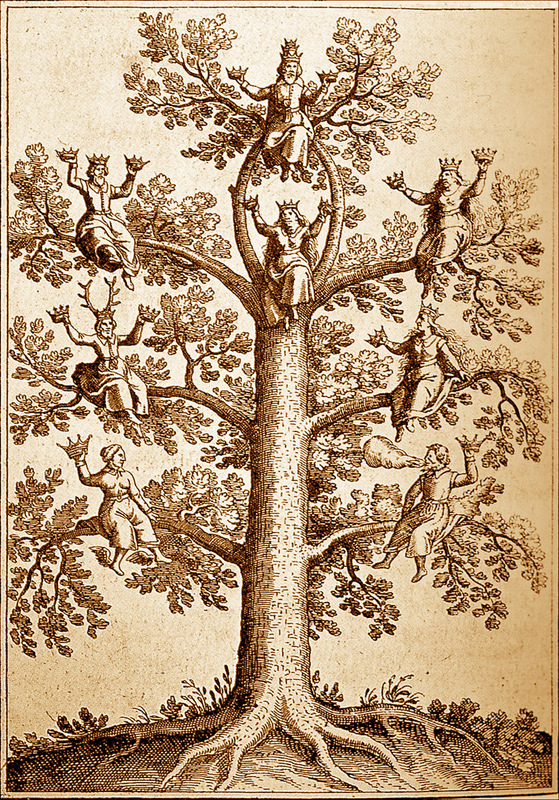 The 7 hands are Böhme's "source spirits", the lower aspects of the Sephiroth tree. The central sun is Böhme's dividing fire, and corresponds to the Sephira Tiphereth, identified by the Christian interpreters of the Cabbala with Christ as the "heart of heaven". When Adam and Eve ate the fruit from the Tree of Knowledge in the Garden of Eden: "And the eyes of them both were opened, and they knew that they were naked; and they sewed fig leaves together, and made themselves aprons." (Genesis 3.7) This awakening symbolizes man's development of the intellect, "knowing good and evil" (Genesis 3.5), for homo sapiens are no longer running around like animals. But the Tree of Life is even more potent "And the Lord God said, Behold, the man is become as one of us, to know good and evil: and now, lest he put forth his hand, and take also of the tree of life, and eat, and live for ever: Therefore the Lord God sent him forth from the garden of Eden, to till the ground from whence he was taken. So he drove out the man; and he placed at the east of the garden of Eden Cherubims, and a flaming sword which turned every way, to keep the way of the tree of life." (Genesis 3.22-24) What is this Tree of Life that makes us immortal like God? It is Cosmic Consciousness, Christ Consciousness, Buddha Mind our true infinite eternal spiritual self which the human ego is ignorant. The Tree of Life may be represented by the Sephiroth Tree in Cabala. The Sephiroth are the ten, primal numbers which, in combination with the 22 letters of the Hebrew alphabet, represent the plan of creation of all upper and lower things. They are the ten names, attributes of powers of God, and form a pulsating organism called the "mystical face of God" or the "body of the universe". The central pillar forms the spine through which the divine dew flows down from #1 Kether (Crown) to #10 Malkuth (Kingdom) bringing blessings of heaven to the material world. Image: This depiction of the Sephiroth tree is indebted to the Opus Magnum. The dissolving and binding powers sit opposite one another on the branches: on the bottom left is volatile Mercury with the winged shoes, and to his right is the firre-spitting Sulphur. Above them, diagonally reversed, are their forms in a sublimated and crowned state. On the top level, the third Work, the two unite as the lunar tincture. From this there finally emerges the solid sulphur, son of the sun. He wears the crowns of three realms, vegetable, animal, and mineral. Little birds are silent in the woods. and stillness is essential if we wish to write or compose something inspirational. to set that Light aside for other sight"
This insight came to me as I was completing these notes Goethe's life was a journey from light to light. Goethe's Autobiography began with "My horoscope was propitious: the sun stood in the sign of the Virgin, and had culminated for the day." Goethe's last words (March 22, 1832) were: "Light! More light!" 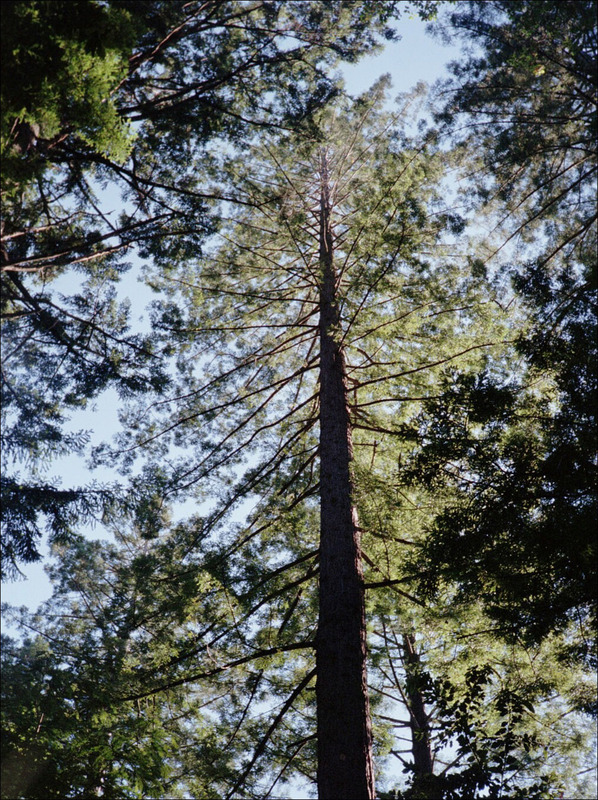 Haiku: O giant redwood tree! / Sentinel of this forest / Bless this earth with peace.